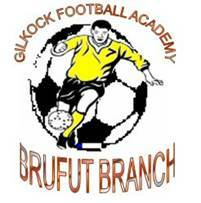 Gilkock Football Academy of Brufut lined up yet another program to amuse its interns (players). 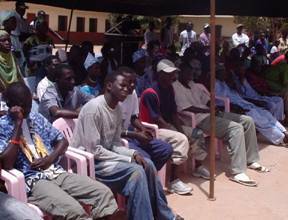 The program they call "FUN AND TALENT EXECUTION DAY” was scheduled for the 12th April 2008 at the Brufut Lower Basic School ground revealed Sang Mendy Public Relations Officer. Dwelling on the reasons for such a program Mendy said "it is prudent to amuse your players especially the young ones after vigorously under going series of training programs which sometimes bore the players. This is why annually we organize such an event. Normally we always go to the beach and spend our day out but this year we taught it wise to bring the event closer to the community". Mendy said the event is going to take the form of individual talent execution and group games coupled with series of side attraction such as music, drama, singing, dancing and eating competition. According to PRO Mendy, the interns are divided into groups and named after the four wards (kabilos) of Brufut as most of the interns hailed from these kabilos and also in recognition of their contribution towards the community of Brufut. Mendy however appeals to the individuals, institutions and companies for partnership or sponsorship towards the success of this day. He asserted that any company or institution that sponsors this fun and talent execution day will be given the opportunity to advertise in the academy's website www.gilkock.com for a period of time without payment. Intended sponsors and donors can contact 9830861 or 7893861 for more information. 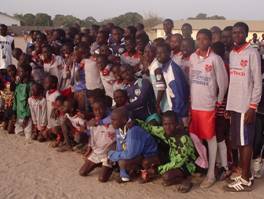 Saturday April 12th 208 was a remarkable day in the history of Brufut, when thousands gathered at the Brufut lower basic school ground to witness the first ever family fun and talent execution organized by the Brufut based football academy. The program full of activities and events began with speeches from various speakers, followed by series of small sided games and individual talent demonstration. In his welcoming remarks Sang Mendy who doubles as the Secretary and the Public Relations Officer briefly explained the reasons for such a program noting all work no play makes jack a dull boy and vice – visa. Mendy also outlined the aims and objectives of the academy, achievements and constraints since the establishment. PRO Mendy therefore called on Brufutarians home and abroad, individuals, companies to come to the aid of the academy in fulfilling their social obligations. 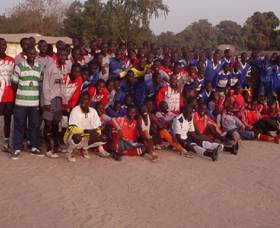 After the deliberations from the speakers invited, the program continued with series of activities among which the six aside games, eight aside games and the conventional eleven aside games within the interns (players) of the academy divided into four groups and named after the wards of Brufut namely Bojang, Jawara, Sano and Manneh Kunda. The first event saw the Under 9 take center stage and in that event Bojang Kunda and Manneh kunda triumphed over Sano and Jawara kunda respectively. In the under 11 it was again Bojang kunda and Jawara kunda that triumph. For the under 13 Sano kunda and Manneh kunda drew one all whilst Bojang kunda escaped with a lone goal against Jawara kunda. For the 16 Jawara kunda sailed pass Sano kunda by 3 goals to 0 whilst Bojang kunda and Manneh kunda drew. Meanwhile in the individual talent demonstration kebab S Camara of Sano kunda surprised everyone by challenging the special one Ousman Jassey of Bojang kunda and in the other demonstration it was Lamin O Ceesay of Jawara kunda who was challenged by his younger brother Ebrima Ceesay. This particular event was the most interesting one as the players that represented their wards are players endowed with great talents. According to the technical director Buba K Jallow the day was joyous one and hopefully this event will be done annually now as the players, coaches and parents all enjoyed the program. In fact for some of the players the event should be done every three months as all work on play makes jack a dull boy and vice visa. On their part coach Boris Demba, Ebrima Bojang, Mbadjie Bojang and Alieu Sanneh applauded the outcome and the support giving to the event. The head of the village (Alkalo) Alhagie Yunusa Sano, in his speech could not hide his joy stating ‘I’ve been monitoring the progress of this academy since it inception. It is now clear to everyone that this academy deserved the support of the village. It has great leaders who have the village at heart and on this note, as the village head you will have my support at anytime’. Sano promised to support and urges all parents to continue praying for the progress of the academy to produce great players in the future. For his part Mr. Bully Sano, younger brother of the Alkalo who was the guest speaker thanked the academy fro giving him the opportunity to be their guest speaker. Mr. Bully Sano said ‘football is a diamond stone that nobody thought of digging hundred and twenty years ago, is a business as rich as the sale of diamonds but this venture was not discovered 120 years ago. So parents, support your children to be involved in this great business. He challenged everyone to put their hands together for the development of this academy that has already started producing great talents. Hearing the weekly wages of a player amazes me and everyone but don’t we want to have our sons and daughters earn something closer to that one day, Bully questioned, the audience answered we want’. In conclusion of his speech, Bully challenged the elders of Brufut and his brother to put their hands together and provide the youths with a land for a football field and multi purpose centre. Speaking on behalf of the Brufut youths and sports development committee, Abdoulie Jawara, secretary, hailed the efforts of the academy citing the immense contribution and the changes the academy has brought to Brufut. The vote of thanks was delivered by Aja Jammeh and the program was chaired by Mr., Bakary B Baldeh, a sports journalist of a renowned media house in the Gambia, West Coast Radio.